Sometimes the classics are all you need. 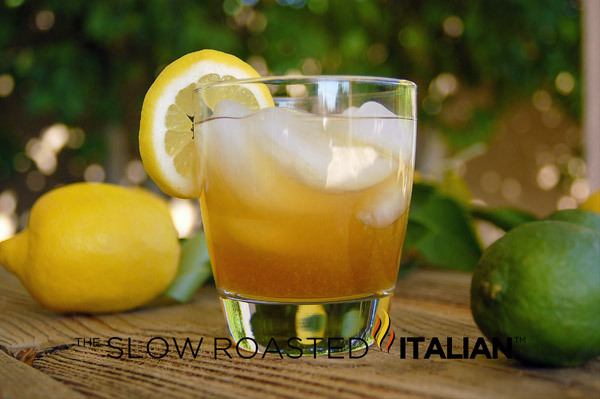 After weeks of creating holiday drinks; that entailed everything from infusing jalapenos in tequila to making peanut butter cocktails, we here at The Slow Roasted Italian needed to cleanse our palates and get back to simple. We decided a delicious classic sippin' drink was just right. Chad and I love everything amaretto. He loves amaretto cake, amaretto icing, amaretto ice cream, and especially DiSaronno Amaretto. So when he found this recipe it was a no brainer. 2 simple ingredients, 1 delicious taste! It doesn't get better than that! So, Slow Roasters, go to your kitchen grab your amaretto and your lemon juice and prepare for the splendor that is the Classic Amaretto Sour. Add ice, amaretto and lemon juice to a cocktail shaker. Shake and serve (pouring ice into glass with drink). Garnish with lemon slice. Enjoy and repeat as desired! Oooh, this drink brings back some memories for me. I didn't realize it was such a simple drink. The picture is gorgeous! I adore Amaretto as well. I would love to sip this on my patio. this drink looks so refreshing, it would really hit the spot! Even though it's only Thursday night here, I am definitely making this tonight. Friday is just too far. Refreshing to the palate...Love the rinse every now and often. Loves its unique taste! Oh yes pls. I have a tree bursting with plump juicy lemons and a bottle of ameretto in the cupboard. That's tonight's drink on the terrace, sat next to the pool, sorted, thanks. Can't wait. I like how you do a lot of classics. This looks great. We're doing tequila sunrises tonight, which made us think of you, might have to make one of these too.